What can I send to Macao? What items are restricted? Send My Bag can help make your journey to Macau go smoothly by shipping your bags to and from your hotel. This means that your luggage will be there waiting for you on arrival, so that you do not have to wait around at bag drop or luggage carousels. You can also avoid the stress of incurring excess baggage fees. You can pack plenty of clothes to see you through hot and humid summer days in Macau. You also don’t have to worry if you buy too many souvenirs as these can be shipped back too. Students can also use our service to help them move to Macau for their studies, allowing them to take daily necessities and other home comforts with them. We can send all sorts – books, clothing, DVDs, writing materials, and much more. Why not send baggage and boxes to Macau with Send My Bag? This is a great option if you are going on holiday to Macau and you need to bring lots of clothing or sporting equipment with you. It’s also great for students, allowing them to bring with them everything they need to get set up in Macau for the duration of their course. To read more about sending luggage to Macau visit our ‘How it works’ page, or our ‘FAQs’. Although better known for its casinos, in Macau you can also enjoy a round of golf at top-class facilities. Why not try out Caesars Golf or Macau Golf and Country Club? You can do so using your own clubs by shipping them to Macau with Send My Bag. This means you can also avoid oversized baggage fees from your airline and avoid having to drag heavy golf clubs onto public transport. Read more about how to send golf clubs with Send My Bag, including how best to package your golf clubs. Although the main peninsula isn’t very suited to cycling, you can head over the bridge to Taipa Island and Coloane Island, where you will enjoy a quieter pace that is more conducive to cycling (just make sure you don’t cycle until you have crossed the bridge as cycling there is prohibited). You can easily use your own bike to cycle round the islands, rather than renting one. You can send your bicycle to Macau with Send My Bag, which is much more practical than checking your bike into the hold of your plane. You will avoid the embarrassment of oversized baggage fees and won't have to carry the bike to and from the airport. Your bike will have to be taken apart and safely packaged before being sent to Macau. Have a look at our information on bike shipping to learn more. If you are planning to relocate to Macau you will have to think about international removals to Macau to take all your things with you. Make sure you search for a reputable removal company and pack everything up well before you hand your items over to the movers. Macau has a number of institutions offering tertiary education, such as the University of Macau, Macau Polytechnic Institute and the Institute for Tourism Studies. If you are a student moving to Macau, there are numerous things you will need to bring with you, such as your course textbooks, writing materials, fiction books for your time off, and daily essentials such as clothing. Shipping your possessions is really useful, as it allows you to quickly settle into your student accommodation. Find out more about student shipping on our student removals page and find out how to receive your student discount. A friend or family member can send to Macau any items you have left behind using Send My Bag’s courier service. Or, friends could send you care packages and gifts to Macau. Just make sure the sender knows about any restrictions on sending brand new items (see below). When sending a parcel to Macau, pick a decent box and tape it up well so nothing gets damaged in transit. Find out more about sending a parcel and learn what you can send with Send My Bag and how to package your items. For sending large bulky items you could look into air freight. Air freight usually takes about one to two days. This means it is quite a speedy service, but it can be quite expensive, particularly if you have an especially large shipment. You will probably also have to pay for the help of a customs agent to handle customs clearance for you, and you will need to find a way to get your items to and from the airport. The price could, therefore, rise quickly. If you send internationally by air freight to Macau your items will likely arrive at Macau International Airport. Instead of air freight, you could choose sea freight, or container shipping, to move big items like a fridge or a sofa to Macau. Since sea freight can take a number of weeks, it is best if you don’t need to receive your items immediately. This option can be less expensive than air freight, but you will still need to pay for the help of a customs agent and will need to arrange how to get your items to and from the port. Your items will likely arrive by ship at the Port of Macau. If you need to ship goods to Macau, you need to find out about any customs duties and taxes you need to pay, due to your items being brand new and not used personal effects. Also make sure you are aware of what items are restricted and which are completely forbidden from being shipped to Macau. Everything went smoothly and all my items arrived on time and we had emails every step of the way guiding us and keeping us updated! Will be using again! If consignments of Personal Effects exceed MOP$5,000 (~$600USD, €570, £400), the consignee will need to be present to complete an import declaration. Because most countries allow personal items (known as personal effects) to cross their borders duty free, the majority of Send My Bag shipments worldwide will not be stopped by customs officials. Personal effects are normally viewed by customs as personal possessions that have been owned by the sender for at least six months. If your bag is stopped and checked by Macanese/ Chinese customs officials and they discover commercial or brand new items, you may be asked to pay customs duties and taxes. You should, therefore, be fully aware of potential customs duties when sending Christmas or birthday gifts to Macau. You should follow any advice given by Macanese customs and attach all documentation required of you. To show that your shipment is made up of personal effects, you will need to create a short packing list online, with entries to be made as follows: "3 x Cotton Shirt, 3 x Pairs of Training Shoes, 4 x Denim Jeans", etc., rather than as "10 x Used Clothing". When a bag is stopped by customs for any reason (missing documentation, prohibited contents, commercial contents or further information required) Send My Bag™ records how long customs hold it for. Our historical statistics for this route indicate that if the customs authority stops your bag they will on average take 3 days to process it and release it back to us for delivery. Customs allowances and processes vary by country, so we suggest all travellers take 5 minutes to assess how their personal circumstances and what they are sending will be considered under current Macanese/Chinese customs regulations. 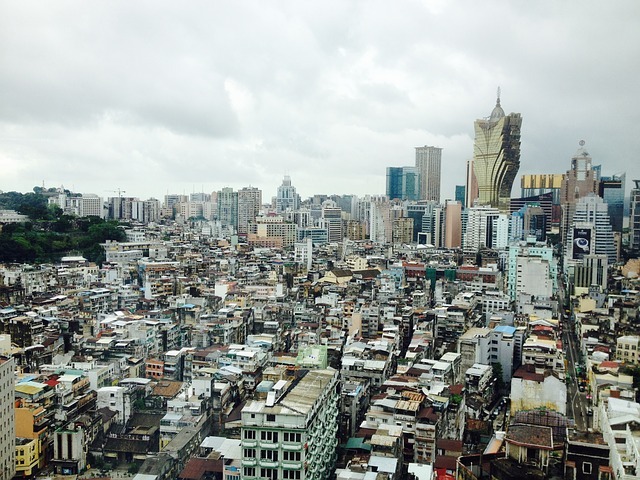 Macau has the world’s highest population density, with 20643.75 people per square kilometre in 2012. Portuguese and Cantonese are the official languages. A creole known as Patuà is also spoken, as is a dialect of Portuguese called Macanese Portuguese. Macau is the only place in China where gambling is allowed – thus Macau’s reputation as the Las Vegas of the East. The Venetian Macao is the largest casino in the world. Macau is thus an exciting destination for gamblers and tourists alike. Macau also boasts a UNESCO World Heritage Site, containing 25 historical monuments and public squares.